Swordfish is well liked here in the States and elsewhere for its mild taste and meaty texture. And the fish’s enormous size means that it is generally sold in large, boneless ‘steaks’ that make for a carefree eating experience. Even folks who are skittish about other kinds of fish often enjoy swordfish. Swordfish is a popular fish in the southern-most reaches of Italy. Sicily is justly famous for its swordfish dishes like pescespada con salmoriglio or swordfish with pasta, but Calabria has fantastic swordfish dishes, too. 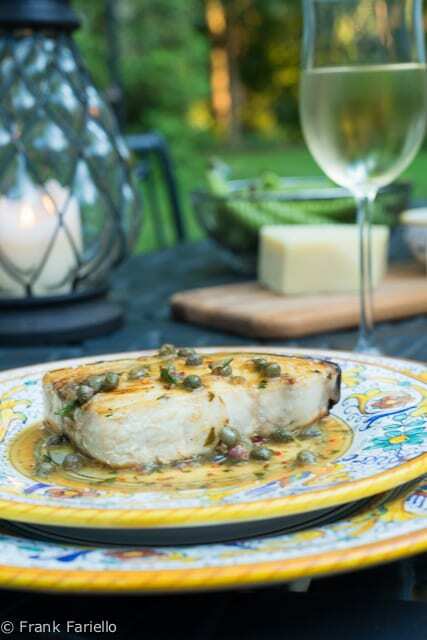 Here’s one for swordfish with capers that you can whip up in just a few minutes. It could hardly be simpler—or tastier. The sauce is reminiscent of Sicily’s salmoriglio but is cooked rather than raw. Sauté the swordfish steaks in olive oil over moderate heat for about 3 minutes or so per side, until they are just lightly browned, seasoning them to taste as they cook. Remove the steaks from the skillet and keep warm. If using garlic, add it to the skillet along with the swordfish and discard it when the steaks are done. Add the sauce ingredients to the skillet, bring them to a simmer and let them reduce for just a minute or two. Nap the swordfish steaks with the sauce and serve right away. Try to find swordfish steaks that have been cut rather thin if you can. This way, the fish cooks really quickly and you get the proper balance between sauce and fish. If not, add an extra minute or two per side to your cooking time. The recipe lends itself to some variations. Add some halved cherry tomatoes to the skillet as the swordfish steaks cook on their second side to make a red version of this dish, and olives make a nice addition to the sauce. They pair perfectly with the capers here, as they do in countless southern Italian dishes. Perhaps the richest of the Calabrian swordfish dishes (also claimed by the Sicilians) is a variation on this dish called spescespada alla ghiotta: add some canned tomatoes, crushed between your fingers, to the skillet after you’ve removed the swordfish steaks, and let them cook down to a saucy consistency. Add the rest of the sauce ingredients, along with the steaks, and let it all simmer for a few minutes before serving. In many recipes, the swordfish is left in the skillet to cook along with the capers and sauce so the flavors meld. Personally, I prefer taking them out of the skillet, which helps avoid overcooking. NB: Swordfish is delicious, but many sources caution that it should not be eaten too often because of possible levels of mercury. The USDA advises that young children and pregnant women avoid it. In the late 1990s in reaction to severe overfishing, there was a successful “Give Swordfish a Break” movement to protect swordfish, and many people stopped eating it altogether. By now, however, swordfish stocks in the North Atlantic are full restocked, although the status of the stocks in other oceans is less certain. Decide for yourself what to do with this information. As for myself, I enjoy swordfish as an occasional treat. Pescespada and Calabria are united in my memory because it was on my visit to that region that I first tasted that fish. Great recipe, as always. magnifica ricetta Frank ! Se trovi i ” cucunci ” , i germogli del cappero con il picciolo attaccato…sarà ancora più buona ! Reading your last two posts has made me look forward to my upcoming trip even more: off to the Italian seaside, to be pampered with MIL’s cooking! Lucky you… have a wonderful trip! Excellent, simple and delicious. Bravo!! I just recently had some swordfish and it was delicious, have to try this recipe as well. I couldn’t find a thin steak though, had to slice it in 3 with the meat slicer…. A perfect dish for summer, Frank. I’m usually grilling swordfish, and adding a tomato salsa, but this will be a delicious change. Looks incredible! I love the simplicity of the ingredients, I am sure it is just divine! Thanks so much for stopping by Alessandra! Beautiful fish! And when the fish is fresh, you don’t want it smothered with strong flavors. Simple perfection!